The Old Fairport Harbor Lighthouse sits at the mouth of the Grand River, about 45 minutes east of downtown Cleveland. 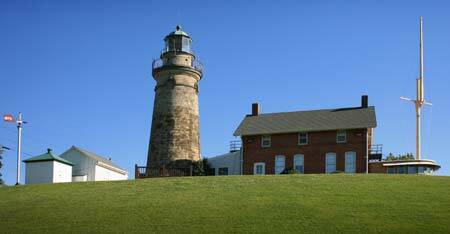 The original lighthouse built in 1825 stood 30' high, capped with an octagonal shaped iron lantern. The lighthouse was accompanied by a 2-story keeper's house. Due to the first lightkeeper's strong views on abolition, the lighthouse served as a guide for runaway slaves marking a stop on The Underground Railroad to Canada and freedom. In 1871, due to deteriorating conditions, the tower and house had to be replaced. Rebuilt in 1871, the tower now stands 60', has a 69 step spiral staircase leading to an observation platform. In 1925 the light in the tower was replaced by a combination light and foghorn station on the west breakwater pier head. 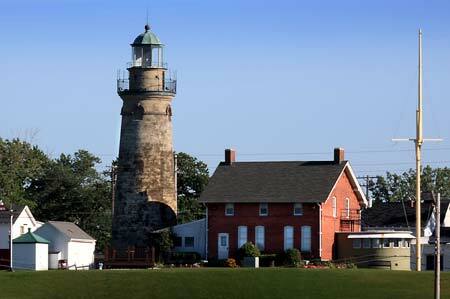 Today the Old Fairport Harbor Lighthouse is the Fairport Harbor Marine Museum. 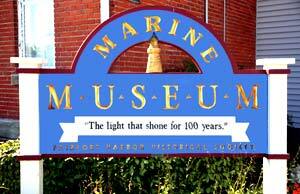 The museum was founded in 1945 by the Fairport Harbor Historical Society. They are dedicated to preserving the historic traditions of Fairport Harbor and the Great Lakes. The museum houses a number of artifacts pertaining to life on the Great Lakes and other maritime exhibits. Attached to the museum is the former pilothouse from the Great Lakes carrier the "Frontenac". 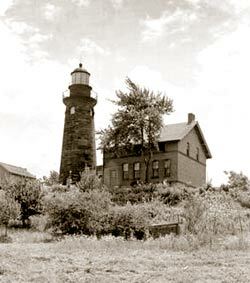 The museum was the first Great Lakes Lighthouse Marine Museum in the country. Wednesdays, Saturdays, Sundays & Legal Holidays: 1:00 P.M. - 6:00 P.M.
Other times tours are by special appointment. For years, volunteers worked evenings in the lighthouse museum related feeling the presence of someone or something in the darkened tower. Curator Pamela Brent swears she has seen the wispy gray spirit of a cat. Skeptics dismissed the ghost story as ridiculous, that is until the winter of 2001. Workers installing air conditioning vents discovered the mummified remains of a gray cat in a crawl space. Today, the mummified remains of the unfortunate cat are on display inside the museum. Volunteers still report sightings on occasion.